Phil Freedman’s latest offering, following his “College Sailing Made Easy” book. 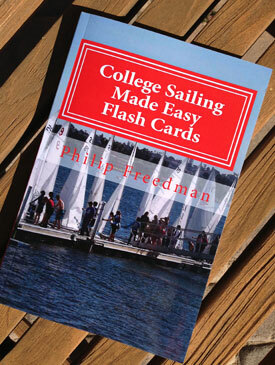 AYC member and certified gadfly Phil Freedman has quickly followed his first self-published book (College Sailing Made Easy) with a second, a clever collection of simple sailing terms presented as flash cards. Call it, College Sailing Made Easy Flash Cards. See: clever. The 150-page book is mostly made up of 120-plus sailing glossary terms, presented two-to-a-page, in alphabetical order. A pair of scissors could turn the book into flash cards for quick study by new sailors. Phil concludes the book with some sailing tips and philosophy and a repeat from the first book of the impressive collection of pictures showing his involvement in the San Diego America’s Cup challenge in the early 90s. The new book hit the starting line on time and at speed. Phil says it sold about 100 copies in the first few days on Amazon. Phil also forwarded us an interesting piece on “How to do a Chicken Jibe.” Read it here.